All of our cabins are completely furnished and include electricity and hot running water. The beds have sheets, blankets, a bedspread, and two pillows. The pull-out couches do not have any linens on them; however they are available for rent. Towels are also available to rent. Our laundry is open every day except Sunday and Friday. Please bring your own soap, and the cost is $2.00 per wash and $0.25 per 7 minutes of drying time. There is some space on a clothes line. Tableware and cookware are provided. In addition, microwaves, electric coffee pots, toasters, stoves, refrigerator/freezers are also located in the cabins. Please bring your own dishwashing soap, bar soap, and garbage bags. Also, please bring your own paper products with the exception of toilet paper, as we supply this single-ply paper for the health of our septic system. You'll need to bring your own food and condiments as there is no restaurant or store at the resort. The closest store for gas, ice, and bait is 7 miles towards Eagle River on HWY 70. It is 13 miles into Eagle River for groceries. Many guests bring their own lawn chairs, but the beach does have plenty of wooden Adirondack chairs. We also have a limited number of life vests that you can borrow. The grills are charcoal/open flame. For ideas on other equipment you might want to bring, please read about all the recreational activities. 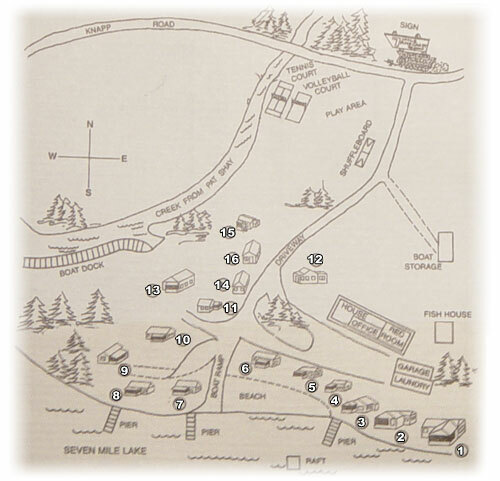 For details of a specific cabin click on it's image in the map, or use the respective numbers on the side. * Not available for rent.